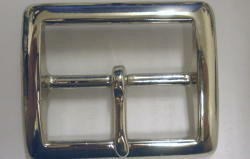 1-3/4in Garrison Buckle (Solid Brass, Nickel Plated) Garrison buckles are an excellent choice for Law Enforcement belts & Holsters. They are very popular with Western Shooters for Holster Belts. Also popular for Reenactors for Scottish Sporran belts.